Are you sure your safety data is telling the whole story? Using data to secure a culture of safety is smart. But, what happens when your data can no longer be trusted? In American Infrastructure magazine, learn about Chula Vista's water stewardship plan and how the city collaborated to reduce its water usage. Free report: Why your company should stop trying to institute a compliance-focused safety culture and focus on creating true risk competence instead. In this dashboard, learn about Haley & Aldrich's key accomplishments of integrating sustainability into our operations and in the work we perform with clients. 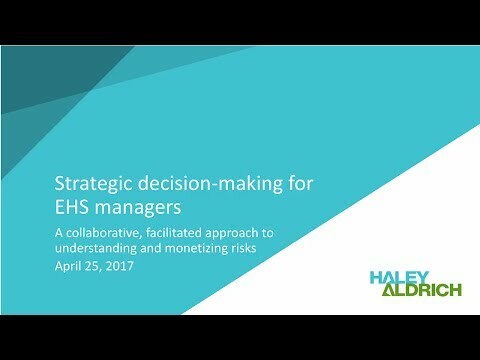 This webinar focuses on how new Lean methods can help EHS managers better understand and monetize risk to inform strategic decision-making. From the May/June 2017 issue of Facilities Manager, this case study demonstrates how UCSF executed a successful customer-driven experiment using Lean. What is the most effective way to approach the semi-privatized regulatory environment for property development? Here are seven things you can do. Learn how Lean can convert facilities challenges into opportunities that improve facilities performance and alignment across your campus to achieve your mission. EPA has published higher risk-based screening values for benzo(a)pyrene. Find out how this might affect your projects. Protecting precious water resources is on everyone’s minds in the City of Chula Vista. Here's how the community collaborated to address water scarcity. Sick of “catching up” and “keeping up” with your campus facilities? Turn your challenges into bright spots. Follow these four steps during landscape planning, and see how the Penn transformed their campus gateway, Penn Park, through landscape architecture. The tool is a new site characterization technology that facilitates 3-D delineation of residual chlorinated solvent DNAPL in the subsurface.